Infectious tracheobronchitis (kennel cough) is the name given to a contagious disease of the canine respiratory tract. The germs associated with this disease infect the cells lining the interior of the trachea (windpipe) and the bronchi (large air passages of the lungs). The disease is usually caused by a virus (parainfluenza or adenovirus type 2) associated with an infectious bacteria (Bordatella bronchiseptica). Other viruses have been incriminated in the disease along with bacteria-like organisms called mycoplasms. Viruses, being extremely contagious, are responsible for the initial phase of the disease. Bordetella bronchiseptica, the secondary invader, is associated with the severe, pronounced symptoms. This disease is extremely contagious for dogs. It does not affect humans. The name "kennel cough" comes from the notion that dogs boarded in kennels are more likely to contract the disease. This is due to the high concentration of dogs, the stress, and the nose-to-nose contact. As long as the dog appears healthy, is eating well, and the cough is not too severe, a trip to the veterinarian may be delayed. If the cough persists or the dog begins to show other symptoms, a visit to the veterinarian is necessary. Infectious tracheobronchitis is extremely contagious and dogs with the disease should be isolated from healthy dogs. If your dog has kennel cough, rest is very important. If a dog with kennel cough is worked too hard, pneumonia can easily develop. Exposure to canine cough often occurs at dog shows, grooming parlors, and boarding kennels. Modern vaccinations are available to protect against the disease. 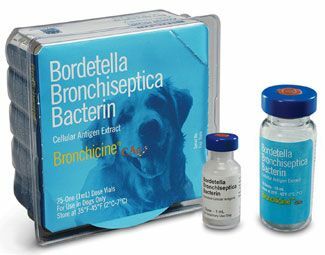 Bordatella bronchiseptica vaccine is recommended for dogs that board at kennels. Consult with your veterinarian for the vaccination protocol that is best suited for your dog.